Toddlers must be able to easily sit up and fully support their head before they can join you for a ride. Many areas have laws requiring children to be at least 1 year old and to wear a helmet while riding in a bike seat. Almost ALL child-seat manufacturers recommend a minimum age of 11 months. Most carriers attach to the back of the bike and are suitable for children weighing up to 38 pounds. Their high backs support a smaller child’s shoulders and head. Though lightweight, carriers do make your bike a bit harder to maneuver. Remember, should you fall, your child falls, too. Child-seats are mounted very close to the bike riders saddle. Although your child might be at or under the recommended weight limit there is a possibility that the child’s knees will make the ride very uncomfortable for the adult riders back. Tip: A bike seat is directly over your rear axle, so your child will feel bumps more than you do. We recommend children in child-seats SHOULD have a helmet. Helmets are a personal item and we always recommend packing theirs when you are getting ready for your vacation. Helmets are available for rent and are adjustable. When ordering just let us know their age. 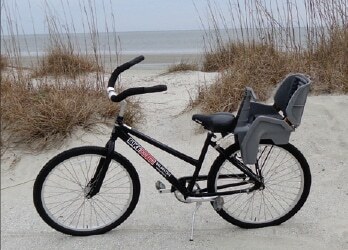 ***Rental bikes equipped with Child-seats are “Unisex” to allow easier mounting and dismounting for the adult rider. ***Due to the attachment technique our Kiddi-Kart CAN be attached to the Unisex bike with Child-seat. 2. The passenger always should wear a crash-tested helmet when transported in a bicycle-mounted child seat. 3. The passenger always should be belted into the child seat. 4. The back of the seat should be high enough to provide adequate head support for the child. 6. Always lean the bicycle against a wall for stability when the rider or the child mounts or dismounts. 8. Never leave a child unattended in a bicycle-mounted child seat. Rear child-seats are typically larger and designed for children aged 1 to 5 years old. Rear child seats are attached on a separate rack or mount that attaches to the frame. Rear child seats also have stability issues due to their high center of gravity. This issue will become more pronounced as your child gets older (or heavier). When mounting and dismounting it’s best to lean the bike against a wall on a flat piece of ground. Because your child is right behind you, you’ll need to lift your leg straight over top tube and hold the bike steady. For this reason, a step-though frame will be much easier to use. My child is too big for a child bike seat. Now what? This is a question we hear quite often and thankfully there are several options to keep your family riding. 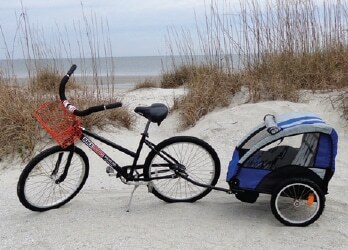 Tag-along bikes and trailers are both great ways to keep older kids engaged and out with the family. Tag-along bikes attach to the adult bike seat post and offer a seat and pedals for the little one. Another positive is that this method allows the child to help pedal if they want. Don’t be surprised if they take a break going up that big hill though! This is a popular option for toddlers and children up to 4-5 years old. You get to cycle; the kids get to sit and see the sights. Trailers are stable and easy to steer. Even if you fall, your child won’t. Tip: Give your toddlers a pillow so their head doesn’t bounce around too much. A trailer bike (sometimes referred to by the brand name Trail-a-bike) allows your child to pedal and feel independent, though he or she is still relying on you for balance and control. This single-wheel bike attaches either to your seatpost so it can pivot for turning. A trailer bike is good for 4- to 7-year-olds. Max 75 lbs. It also allows you to cycle farther than your child’s stamina might otherwise allow. This is a good alternative if you are planning on bike rides long enough to tire out children riding a smaller youth bike. Seats have quick releases to allow seat height adjustments. Remember when maneuvering the combo of bike and Trail-a-bike are longer so turning a corner needs some getting used to. We ALWAYS will attach these to our Unisex bikes to allow ease of mount and dismount. Bikes with training wheels can give children the confidence boost needed so they can start riding on their own. Once the confidence is there, the training wheels can be removed. These are single-speed bicycles with coaster brakes. Training wheels should just be off the ground by ¼” – ½” to “help” give assurance the child will not tip. The most common sizes are 16″, 20″ and 24″. The right size is one where your child can comfortably get on the bike and stand with his or her feet on the ground. If your child is new or inexperienced, take advantage of our islands beautiful packed sand beaches to limit the “drama” of a fall. The beaches offer a little more room to roam when training or first starting out. A bicycle built for 2 is another option for the beginning cyclist. They offer the security of an adult having control of balance and speed with the freedom of the “passenger” being able to assist pedaling or just cruising enjoying the sights. These are a great option for kids maybe 7 plus. Tandems are offered for rentals, but we carry only a limited quantity, so we suggest reserving as early as possible. 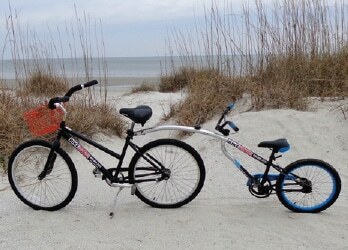 **Due to the tandem bikes length we DO NOT ATTACH a Kiddi-Kart OR Trail-a-Bike. **Helmets are NOT included with our rentals. **Kiddi-Karts and Trail-a-Bikes can be ridden on the hard pack sand.